TK, I’m not convinced that running them higher will completely solve the problem. I’m not convinced it will help either. Changing the speed doesn’t guarantee that parts won’t resonate any more. But a different speed should at least change the harmonics and might make the waveforms stop aligning with the hardware’s sweet spots. Then again, it could also make things worse. Depends on the individual host, I suspect. It’s probably more effective to do as you said, physically alter the connections a bit, and thus change the hardware’s resonant sweet spots. Technically since we’re playing with unknown resonances of hosts/sprimgs/joints, lowering the pwm a tiny bit might help just as much as raising it. Just tried the black fabric thing with an A6. It actually works! Which is also what I measured in the past on an oscilloscope with other firmware running fast PWM with the AtTiny13 at 4.8 MHz. I know according to the Atmel datasheet it should be 4.8 MHz/256 = 18.75 kHz, but I think we are missing something somewhere. Phase-correct PWM gave 7.2 kHz v.s the 9.4 kHz expected. The MCU output signal going to the 7135s on a 105C is not pretty with high frequency PWM. These chips were never designed to switch at 20 kHz. This is why PWM < 5/255 is not stable with high frequency PWM. The signal needs that 5/255 time just to stabilize. You also need to add about 9 to the PWM level to get the expected current with fast PWM, e.g. 73 vs. 64 for 25% current. So I tried a 9.6 MHz/8 MCU clock with phase correct PWM. This gives a PWM clock of 2.35 kHz according to the datasheet. I measured 2.22 kHz, so much closer to the calculated value than with the 13.5 vs. 18.75 kHz above. I can see the PWM when flicking a business card, and it is slightly audible, but it is not bad. Moon mode can go very low and is much more stable with dropping voltage. I like the trace much better on the oscilloscope, and 64/255 actually gives 25% current. Will have to try it in a light to see if it is acceptable. I have a somewhat off-topic question: Why are the threads at the tail end of the battery tube anodized on this light? I know that it allows lockout, but why would you need/want lockout capability for a light with a mechanical switch? About buried stuff: I can find the output and currents of the BLF-A6 firmware (like above in the OP) but can not find back how in each mode the current is cleverly divided between FET and 7135, and what frequencies are used. Where can I find that again, or can someone repost it? I personally haven’t been locking mine out but I can see since I am using the pocket clip for edc how you could switch it on trying to put it away. I think the anodized threads fall along the lines of trying to please as many people as possible. I personally haven't been locking mine out but I can see since I am using the pocket clip for edc how you could switch it on trying to put it away. I think the anodized threads fall along the lines of trying to please as many people as possible. Two more reasons to anodise the threads: 1) it is easier in the manufacturing process, you can do the anodising at the end instead of halfway before machining the threads and extra risking damage of the ano, 2) anodised threads are way more wear-resistant than bare aluminium. The best compromise is the threads on the head side not anodised for maximum electrical contact, and on the tail side anodised against wear from swapping batteries, and possibility of lock-out. Looks like I'm having some common 7135 issues. I'm trying to get at the driver and I get this brass retainer ring off. I've tried turning it with quite a bit off force and no joy. Should I try gentle heat or is there some other trick? Don’t pour the oil in and don’t spray the lube in directly. Just take a drop, smallest possible amount, put it in on the end of a toothpick, and draw the tip all the way around the circle wetting it where it can work its way into the threads. Then put it so gravity works for you and leave it overnight. Wipe out the threads with something that won’t leave more stuff in the threads where they’re rough — microfiber cloth maybe. Look hard for any little ‘boulders’ of swarf sitting and jamming the thread where the ring needs to turn. Wiggle the ring gently with the needlenose pliers. Wipe and maybe oil/lube one more drop, no more. Why all this? Guessing/speculating these were assembled without being cleaned and/or in a dirty environment, so it’s possible any sort of stuff is down in the threads in small sized bits. Anything from metal filings to, well, anything. So you may be trying to dissolve something, or dislodge something. This is basically how I got the stuck head off my light. I personally haven’t been locking mine out but I can see since I am using the pocket clip for edc how you could switch it on trying to put it away. I think the anodized threads fall along the lines of trying to please as many people as possible. I’m not intending to argue (but I guess I am), but it seems like the problems that some (a lot?) are having with lights not working because of slightly different tube dimensions because the threads are anodized are way worse than the positives mentioned? The button is not stick out of the rear, so it seems like it’d take some effort to turn it on accidentally when in pocket especially with the clip? I can’t find it either. TK’s firmware links may tell. But she will know for sure what. 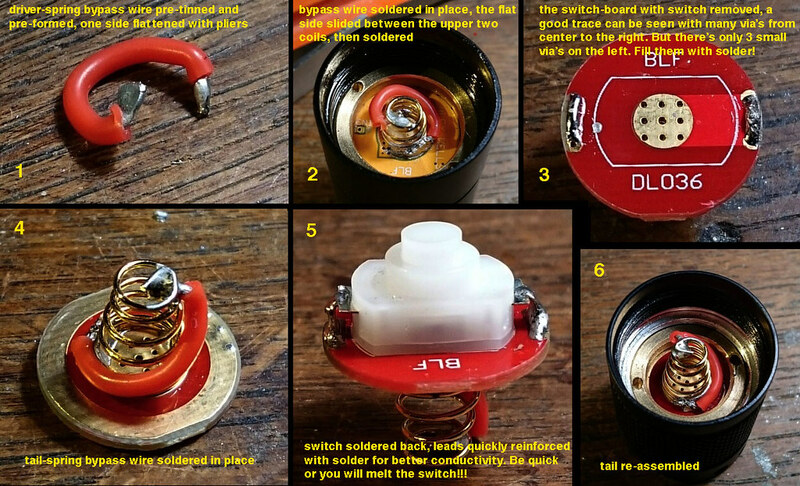 I think 1-4 use the 7135+ pwm, then just pwm 5 6, fet dd for 7. Try a drop of penetrating oil ("nano-oil" works well for me -- 'oogle it for more, it's debated among watchmakers, gunsmiths, and other users of moving parts) and/or a drop of tuner cleaner/electronics cleaner/lubricant (I have an aerosol can from somewhere) Don't pour the oil in and don't spray the lube in directly. Just take a drop, smallest possible amount, put it in on the end of a toothpick, and draw the tip all the way around the circle wetting it where it can work its way into the threads. Then put it so gravity works for you and leave it overnight. Wipe out the threads with something that won't leave more stuff in the threads where they're rough -- microfiber cloth maybe. Look hard for any little 'boulders' of swarf sitting and jamming the thread where the ring needs to turn. Wiggle the ring gently with the needlenose pliers. Wipe and maybe oil/lube one more drop, no more. Why all this? Guessing/speculating these were assembled without being cleaned and/or in a dirty environment, so it's possible any sort of stuff is down in the threads in small sized bits. Anything from metal filings to, well, anything. So you may be trying to dissolve something, or dislodge something. This is basically how I got the stuck head off my light. Thank for that, makes sense. I'll put a few drops on and leave it a few days for the oil the penetrate. Anything volatile is going to evaporate and deposit further inside the light. 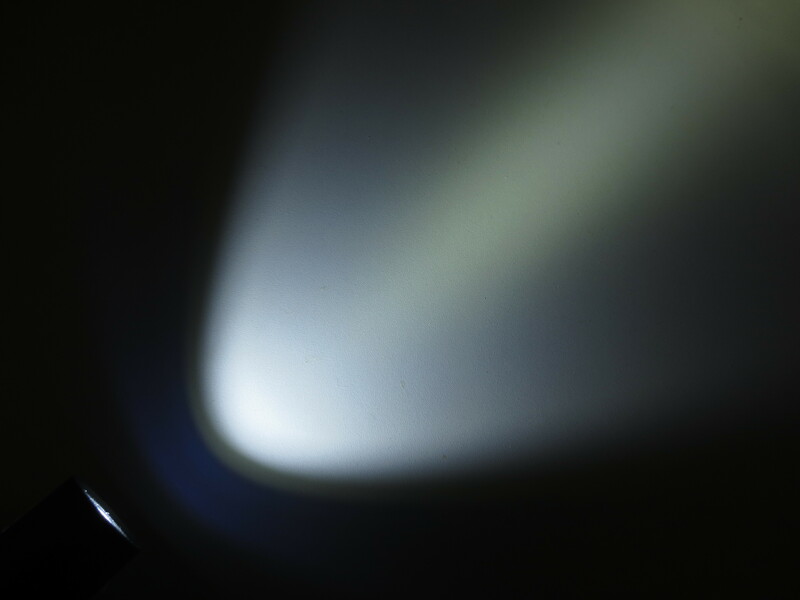 LED emitters are known susceptible to contamination from anything volatile — that’s why there’s sealant over the emitter, but it’s not a perfect protection. Anything — temperature control gunk, O-rings, solder/flux, cruft, penetrating oil — is going to volatilize to some extent. One drop of whatever, with that drop led around the groove with a toothpick, and let it work its way in. Don’t mind me, I’m just nitpickery about this stuff. Pics added! function check, tools, spring bypass, sanded star. Member vinte77 found an awesome pocket clip of you’re into that sort of thing check in the opening list for a link. @dudunphy, what a great thread you have started! Your OP is full of useful, and informative information. It has also prompted some of the brightest forum members to add their helpful input. This thread, in my opinion, gets right to the heart of what BLF is all about. Thanks scotlarock! This light deserves it and looks like more of these drivers will be getting used so I hope it is helpful for a long long time. Hi didunphy, the driver spring bypass you show in the OP is kind of tricky because with the bare wire used and the retaining ring in place, if the wire is not positioned perfectly, there's a chance of shortage against the ring and that is a direct battery short. Using silicone wire makes it less critical even tough it still must be done with care. Someone had a link to a tir lens from fasttech that fit the a6. That might be nice to add to OP. You’re right djozz. I wish I had ordered some of that with my last shipment. I will take that down until I can get a pic of a safer method. And I’ll get that tir link as well. Thanks! When opening the head, there’s a risk of damaging the LED. Therefore I would firmly hold down the lens (not too much force, it’s glas, you could break it) when unscrewing the bezel to help the torque you’re producing doesn’t act as much on the LED through the centering adapter. This also applies for tightening down the bezel during reassembling…. 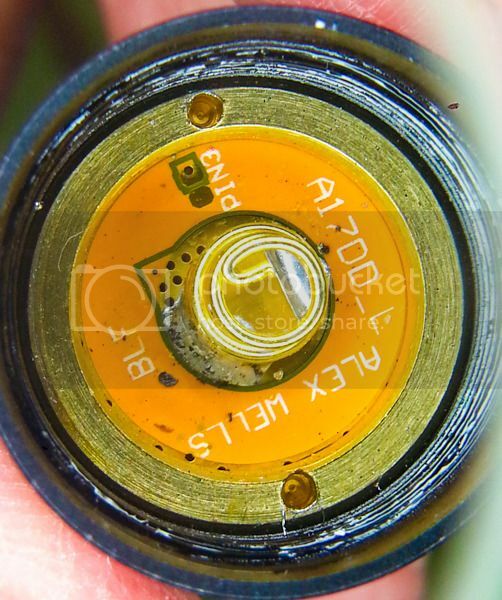 Has anyone tried substituting one of those “butterfly” type spacers, that seem to stay on the emitter board rather than move around with the reflector as the bezel is turning? Looks like I’m having some common 7135 issues. I’m trying to get at the driver and I get this brass retainer ring off. I’ve tried turning it with quite a bit off force and no joy. Should I try gentle heat or is there some other trick? If the driver retaining ring turns a little then stops, don’t force it. Instead, turn it to the middle of its loose range, grab it with tweezers, and turn while lifting up. It may need a bit of help to “catch” the next set of threads. On some units (including the EE ones), it seems there is a small gap between two sets of threads there. It can be tightened easily since it falls from one set to the other, but unscrewing it requires a more delicate touch. … buried stuff … can not find back how in each mode the current is cleverly divided between FET and 7135, and what frequencies are used. Where can I find that again, or can someone repost it? How about I re-post a bunch of stuff? Uh, what does that mean? It means modes between 5 lm and 155 lm will keep the same lumen level for most of the battery’s life because those modes are regulated. 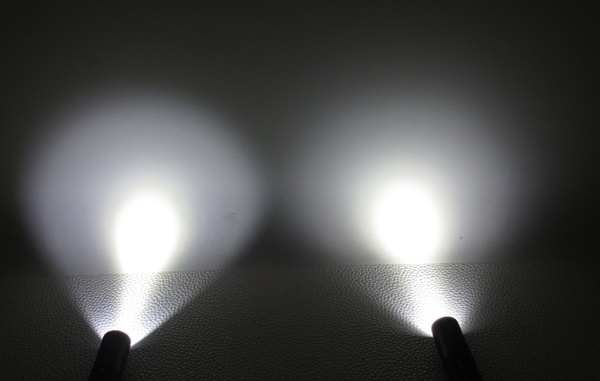 Modes above 155 lm will gradually decrease as the battery charge drops, with the effect being most noticeable at the highest modes. Moon will also gradually decrease with voltage. The semi-regulated modes will still drop with voltage, but the slope of that curve will be less steep than if it were direct-drive. What mode level is the highest using just the 7135? 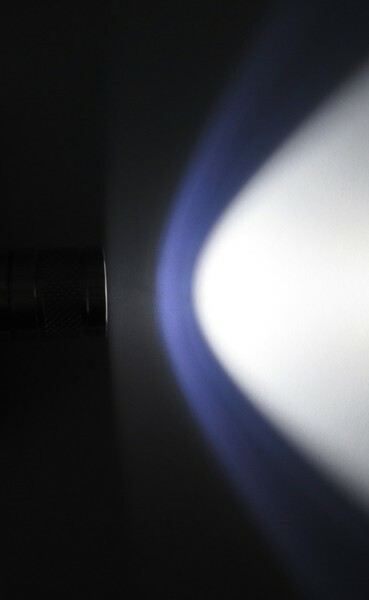 The highest output the 7135 can do by itself is about 157 lumens. This is used only on the biking flasher. Other modes are calibrated to be evenly-spaced, and none fall exactly at the maximum level for the 7135 chip. On a visually-linear (cube-root) scale, the X6 v1’s perceptual brightness goes 1.77, 6.21, 8.24, 9.73. These represent how bright it looks to a human eye, in arbitrary units. Big gap at the beginning, then only small gaps for the rest of the range. The gaps are 4.44 visual “steps”, then 2.03, then 1.49. The brightest mode looks about 5.5 times as bright as the lowest mode. The “visual step” gaps here are: 1.58, 1.76, 1.71, 1.72, 1.94, 2.02. Those last two are a bit brighter since it was calibrated without spring bypasses, and this sample had a spring bypassed. In stock form, each level is about 1.7 “perceptual units” away from its neighbors. And the brightest mode looks about 16 times as bright as the lowest mode (though in reality, it’s ~4200 times as bright). These gaps are: 2.95, 3.15, 3.05. 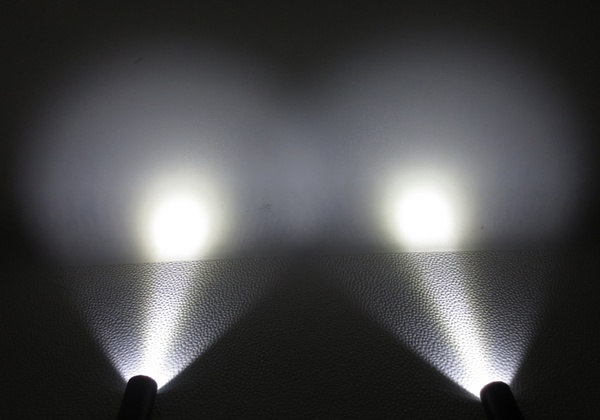 So, this is one little thing which got fixed since the original BLF X6. 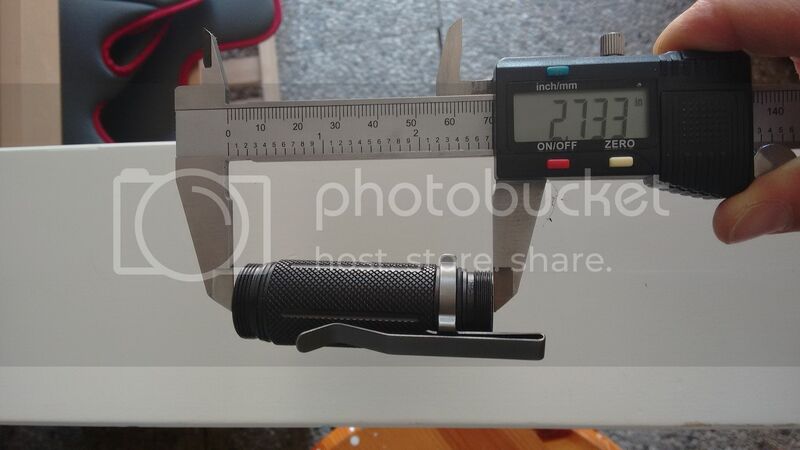 Hi, just a quick update with lumen measurements from a totally stock production unit in 3D tint. I used a Samsung 25R cell charged to 4.18V, and measured the initial output (not at 30 seconds). 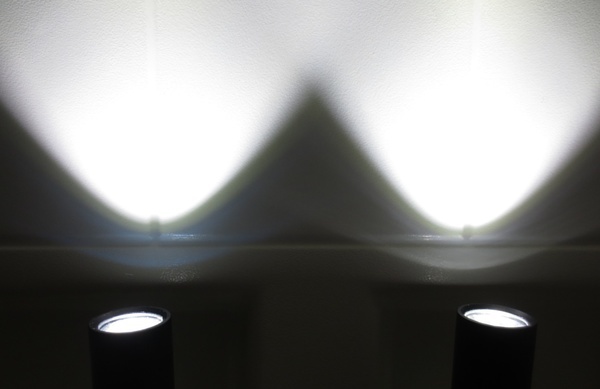 The “visual” units are a cube root of the lumen output, based on the “visually linear” scale used by selfbuilt. They represent how bright it looks to the eye, in arbitrary units. The levels could be a little more evenly-spaced, but it’s not bad. I calibrated the sample to 1.70 perceptual units between each group A level, and IIRC about 3.00 units for each group B level. But it’s close enough that it looks pretty even in person. And I expect it will vary per-unit anyway, so the spacing should be pretty close overall. Also, the space between upper levels will increase with a spring bypass. So. 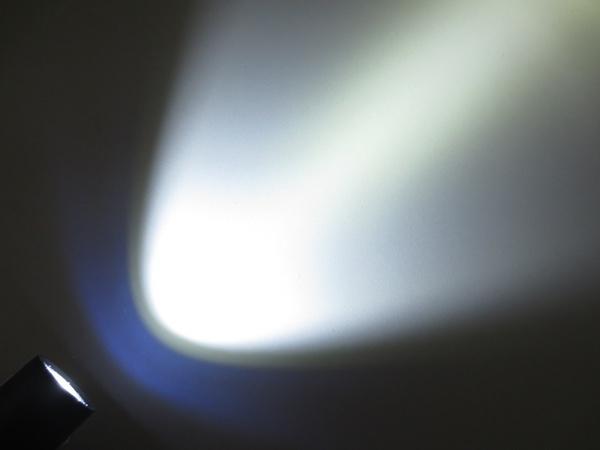 The light performs according to spec. This is good news! Someone asked me if the Solarforce L2 clip would fit the BLF EE A6. The answer is yes, but it will need a piece of wire or something inserted into the tailcap to fill in the gap between two contact points. It also will have a ledge sticking out a little past the body, all the way around. FWIW, I usually try to keep my cells somewhere in the middle of their charge. Discharging too far can damage the battery, overcharging can damage the battery, and even resting unused at 100% charge for long periods can permanently reduce the capacity. I hear the recommended storage voltage is about 40%, to maximize the number of years a cell will last. So, I generally charge a cell to 4.18V (picked a charger on purpose which stops a little early), use the light for a while until it’s down to one or two blinks, then switch to a different light and repeat the cycle. This way I get to use all my lights, and I avoid the conditions which reduce cell life. The LVP functions should work reliably, and are intended to let you get the last few drops of power out of a battery without actually getting into dangerous territory. Draining a cell that far will use up its lifetime-in-years faster, but it won’t actually destroy the battery. 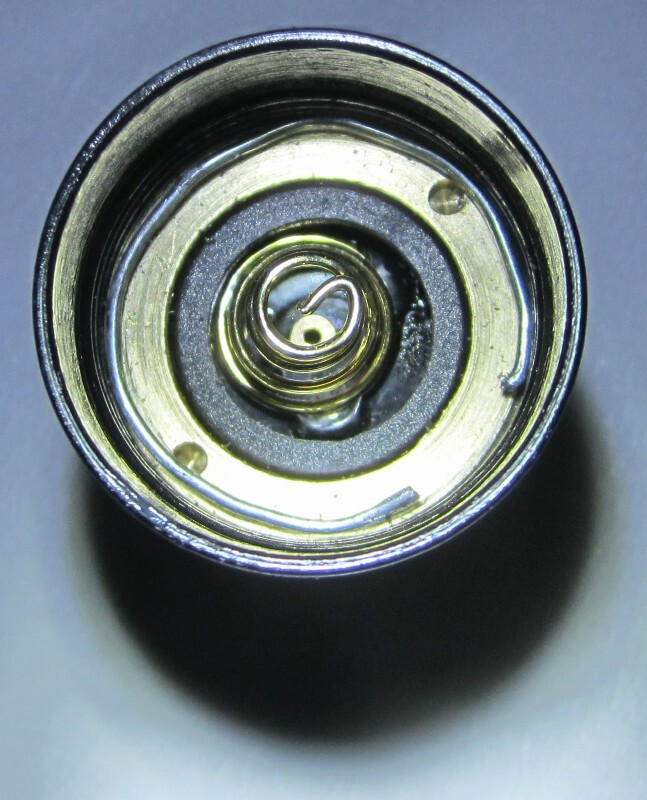 A 2.8V cut-off is a balance between using as much power as possible and avoiding cell damage. There’s only like 2 or 3mAh left at that voltage, so you’re not missing much. 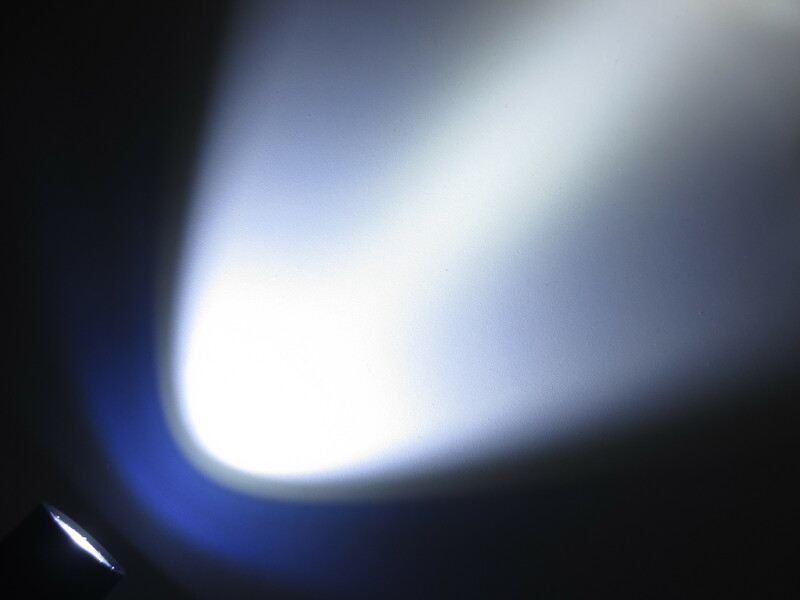 It also provides a longer window for the operator to react and click the light completely off. This has mostly been tested on a bench power supply though, since I have no 3.0V cells to test with and don’t want to regularly inflict this kind of abuse on my 3.6/3.7V cells. Plus, it makes testing a lot easier and faster. If the light was in a blinky mode when LVP hits, it’ll “step down” to medium then proceed normally. You can also bump the mode back up if desired, but it will probably step itself down again within a few seconds. 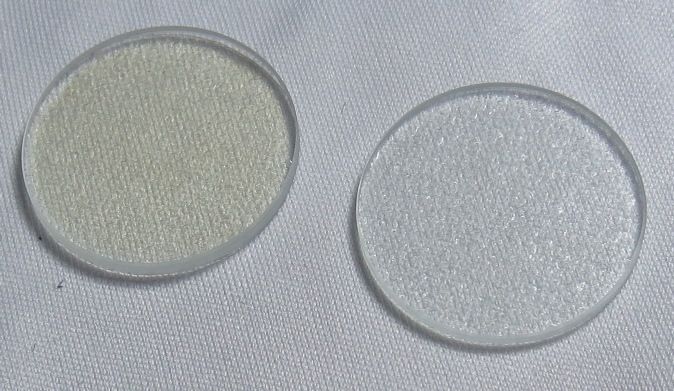 The AR coating on the lens is real, as shown by the blue halo. Expensive name-brand lights often do the same thing. Tint is different on the two power channels, so it will gradually get cooler as it gets brighter. 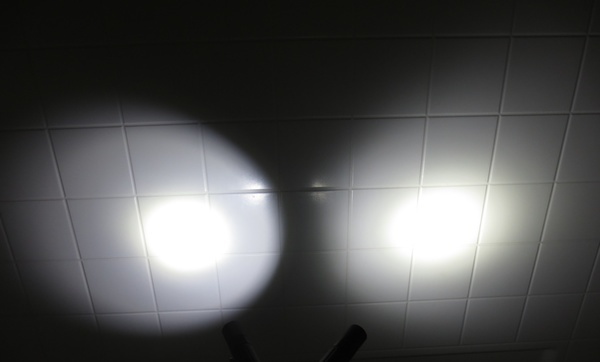 Tint varies between spill and spot, as usual for Cree emitters when aimed by a reflector. Although these pictures are straight from the camera, they show the tint variation a lot more vividly than what you would see in real life. Human eyes adjust to the tint so it’s not as noticeable. Also, I made something else which curiously changes color while you look at it. If I toggle between the BLF A6’s 7135 power channel and the FET power channel at the same lumen level, the LED changes tint! I don’t have a proper youtube account to host it on, but if you like you can still see a short video of the effect from my site. 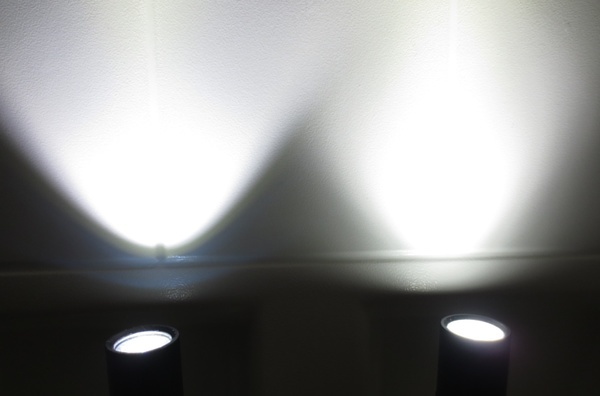 It’s the one on the right; the Nichia 219B light on the left is only for tint reference. I took some beam/tint shots showing what happens if you replace the lens with a non-AR one, and what happens if you put DC-Fix on the stock lens. The result is pretty subtle for AR, but pretty significant for DC-Fix. … and again with a Nichia 219B triple in the middle. 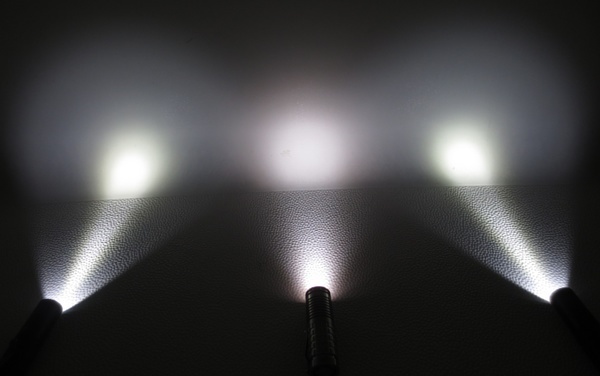 Oh, the AR coating increases lumens and throw by a few percent… but it also changes the tint. It causes a slightly warming green shift. This works like a prism, bending light depending on the color, diverting blue to the side while other shades pass straight through. 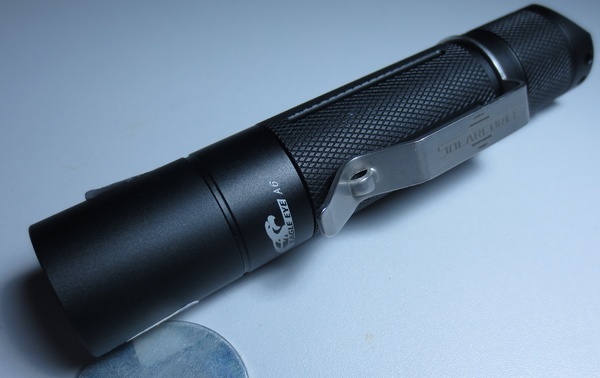 The effect is mild on the Manker lens, but EE’s lens has more of a medium-strength green shift. Neither is as bad as some of what Olight or Eagletac have used though. If a light is intended to have good tint, it needs a non-tinted lens. If it’s designed mostly for throw, an AR coating may be more appropriate. It would be cool if we could get clear glass on the neutral white units and AR-coated on cool white. These each show how much blue light is being diverted sideways. This makes the center of the beam warmer and greener. And I don’t have a shot comparing a Manker vs EE beam slice, but I do have one showing their AR coating. EE’s lens is bluer, which I don’t like. 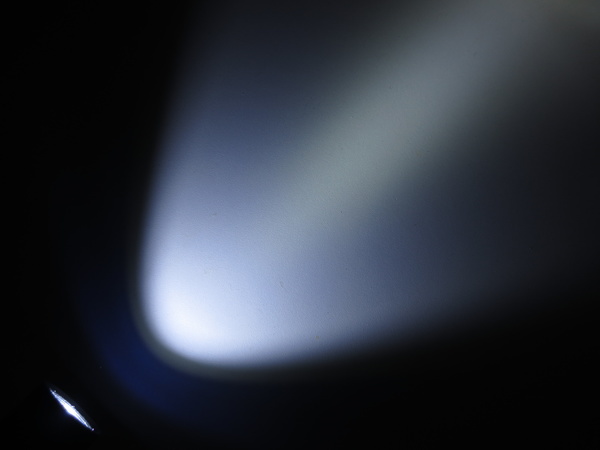 As for the light which passes through into the middle of the beam, this shows the approximate tint shift to be expected after blue has been diverted. Wow thank you guys. You don’t know how much this helps me! Good thing I have post 2 reserved! Or is it best to keep this all in the o.p.? Just keep it in all in the OP, I'd say. (not sure if names should be in the title). Tightening it with Greyskull Power, I could have it light up and behave badly but consistently: it will not turn on on first click, but on third or so, and then it can cycle modes, but again it is weird: it has no moonlight, first two modes are identical, then a sort of medium, then last two higher modes are identical too. So, what is going on? Shall I ask for replacement or just a longer tube? Anyone experiencing the same driver behavior? Nope, you’re the first to mention anything even vaguely like that. I think you win the prize for weirdest A6 behavior. Unfortunately, the prize reward is only a weird A6 and a possible bonus conversation with Banggood’s customer support. 1st mode: ramps from low to turbo, holds there for a few secs then goes back to mid. 2nd mode: ramps from high to low, holds for a few secs then turns off. 5th-7th mode: same as 4th mode. Starts in the 3rd mode to give an idea of the brightness. 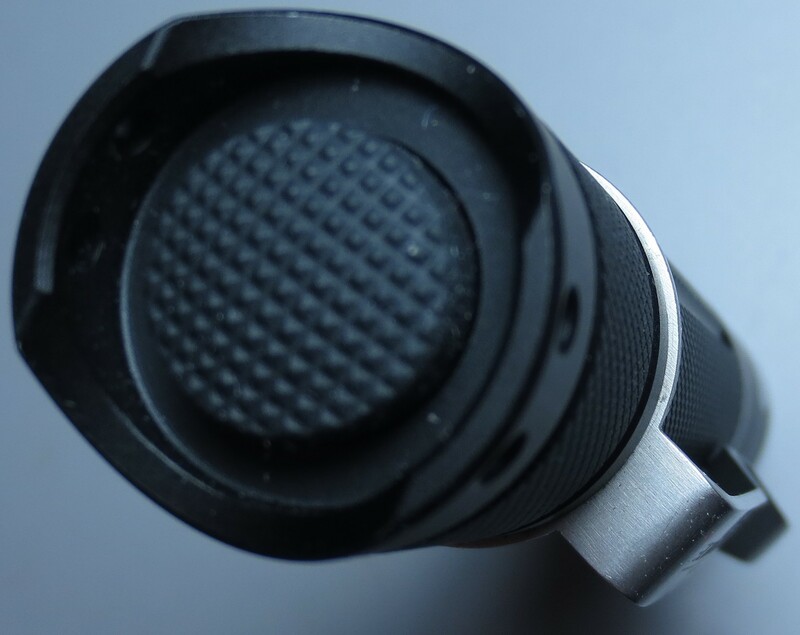 Double hard click used so it can be heard when changing modes. … it will not turn on on first click, but on third or so, and then it can cycle modes, but again it is weird: it has no moonlight, first two modes are identical, then a sort of medium, then last two higher modes are identical too. That’s not a tube length issue, that’s a bad or badly-soldered 7135 chip on the driver. It’s the chip with 3 legs on one side and only 1 on the other. I finally acquired one which acts this way so I can test and debug it, but as far as I can tell it’s entirely a hardware issue. I think someone already reported that they fixed one by re-soldering the chip, but I still need to try that. You know you don’t have to actually click the button to change modes, right? All it needs is a gentle half-press like what one might use to get a camera to focus without taking a picture. A full click is only needed to turn it on or off. In any case, I have no idea why it would behave that way. The code doesn’t have anything even similar to ramping built in. It’s like it’s running totally different code. Ugh! Well, thanks for letting me know. Unfortunately I have close-to-zero electronic skills, let alone the time to figure how to re-solder a 7135 chip on the board. I think I will contact Neal and point him to this discussion to see if I can get a replacement.